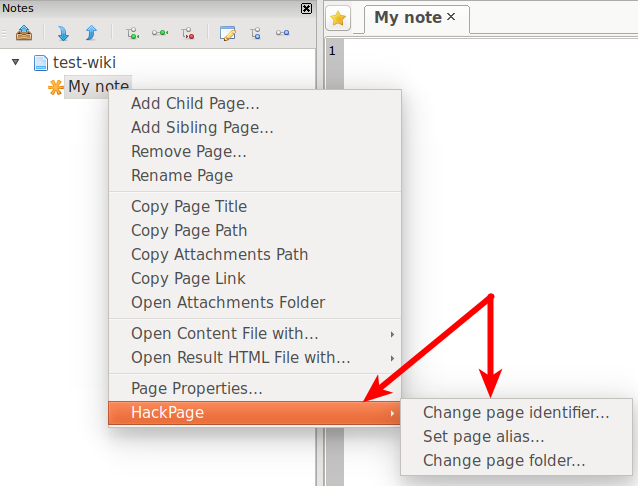 The HackPage plug-in designed to change the hidden parameters of the notes, which unavailable through the basic program interface. A new submenu "HackPage" will be adding to "Tools" menu after plug-in installation. 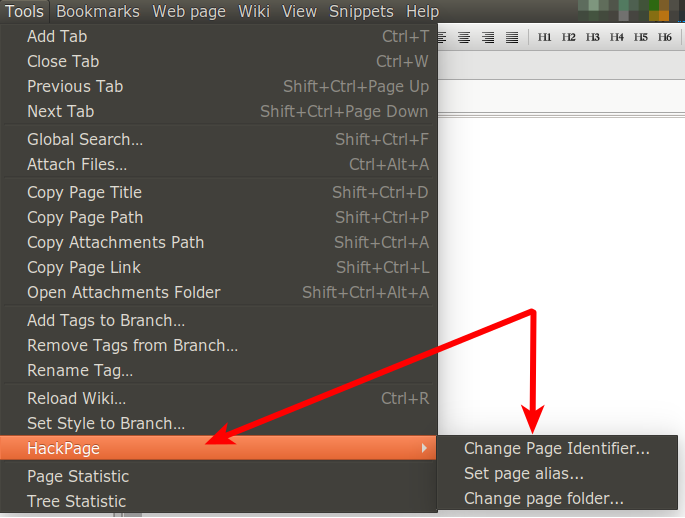 The same submenu will be adding to the context menu when showed after right-click on the note. To set the alias for a page. To change the storage folder of note without changing the note name. Consider these possibilities in more detail. Starting with OutWiker 1.8.0.732 has been adding the opportunity to make the links between pages with the page identifier (without page names). To get a link to the page designed menu "Tools -> Copy Link to Page". The original identifiers looks like so page://__49ee3b83-dff4-479c-b1ad-a3edd2ace99e. Such identifiers are unique but not descriptive for users. When you select a menu item "HackPage - Change page identifier..." will be open the dialog, where you will be able to change the page identifier. Before OutWiker 2.0.0.808 the names of the notes had been matching to the folder name, where these notes are located in the file system. Since the specified version the pages can have aliases, and then in the program interface they will be displayed not by folder names, but by the alias. The basic interface do not have the ability to set any alias. This is designed that not to confuse inexperienced users. With the HackPage plug-in you can set the aliases page. To set an alias select the menu item "HackPage - Set page alias..." from the context menu or the menu "Tools" in the main menu. In this case a following dialog will be shown to enter a alias. With the aliases the notes can have names with all the symbols which unacceptable for the file system of the operating system. With the plug-in you can create multiple notes with identical display names within the same parent notes. When you enter a new folder name you need to consider, what the name is limited of the operating system as and the names of the notes. For example, in Windows you can't use characters such as quotes, asterisk, colon, etc. In Linux you can't use only direct- and backslashes.